Even if working from a fixed recipe (a starting point in most cases) last minute changes can be made to accommodate personal tastes. 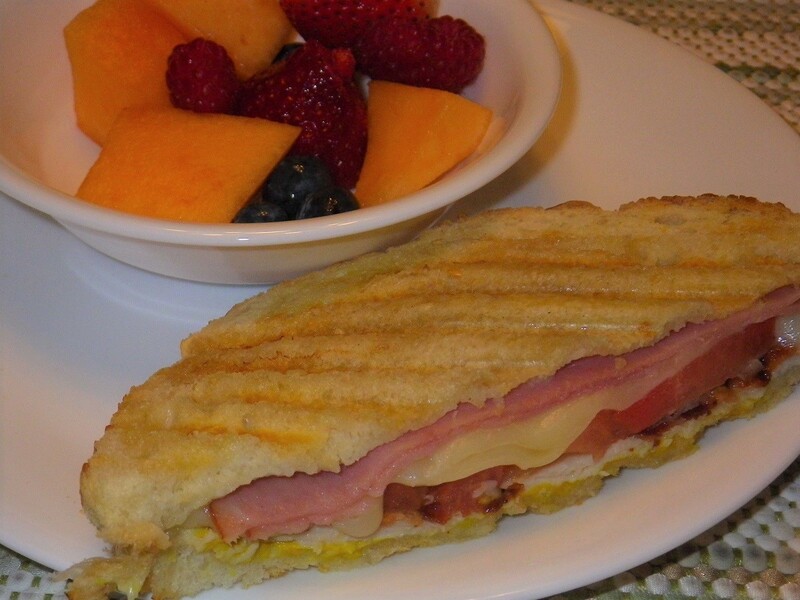 This sandwich is made with sourdough bread from the local bakery. I prefer the Swiss cheese and the wife prefers the American cheese. I like a bit of onion on mine and my wife does not. 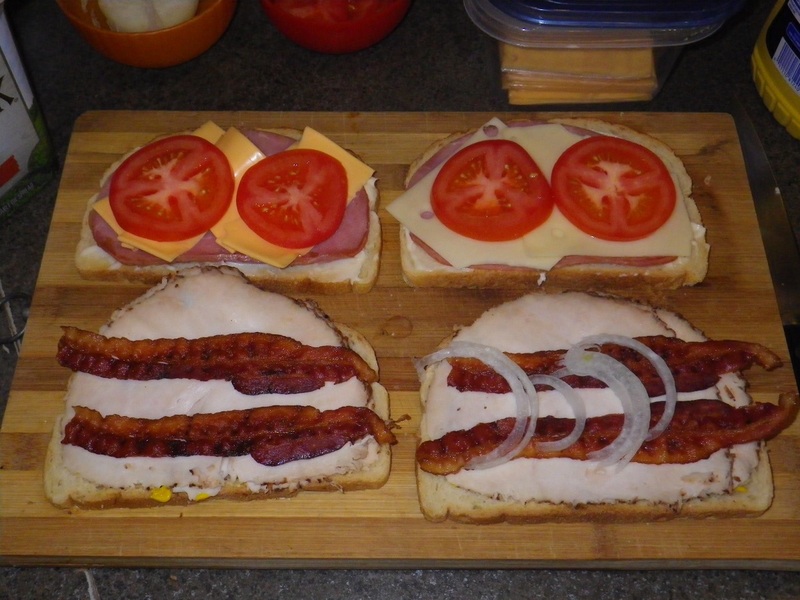 Here both versions of the same sandwich are being made side by side. What have you done lately to personalize your food? 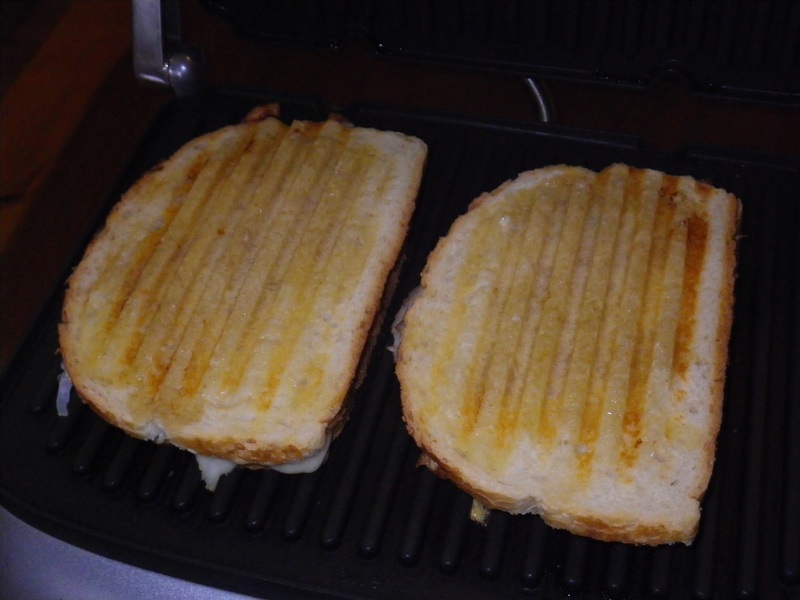 Our GE counter-top grill has interchangeable plates, one for paninis, and does an excellent job. 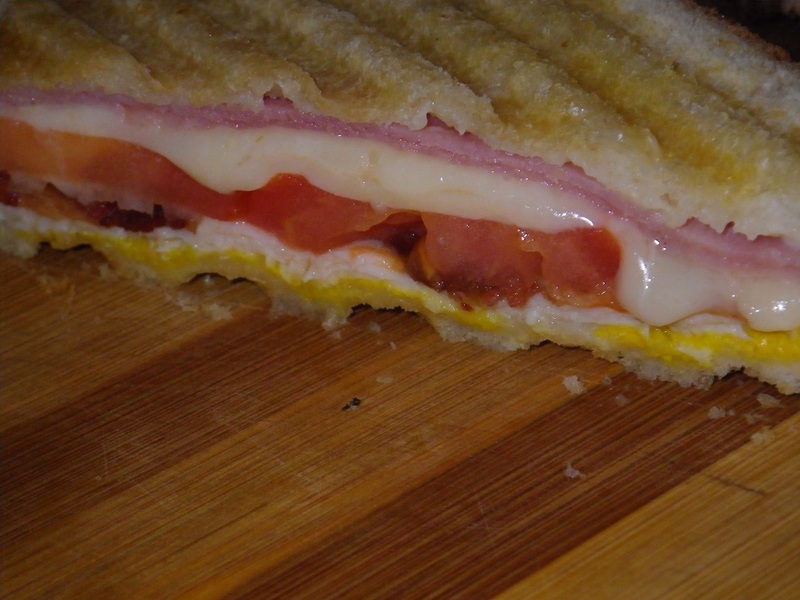 A large cast-iron skillet with a smaller skillet sitting top of the sandwich works just as well so you can make panini sandwiches without the need for special tools or appliances. Butter lightly what will be the outside surfaces of the sandwich. This will help make a nice golden brown toasted color. 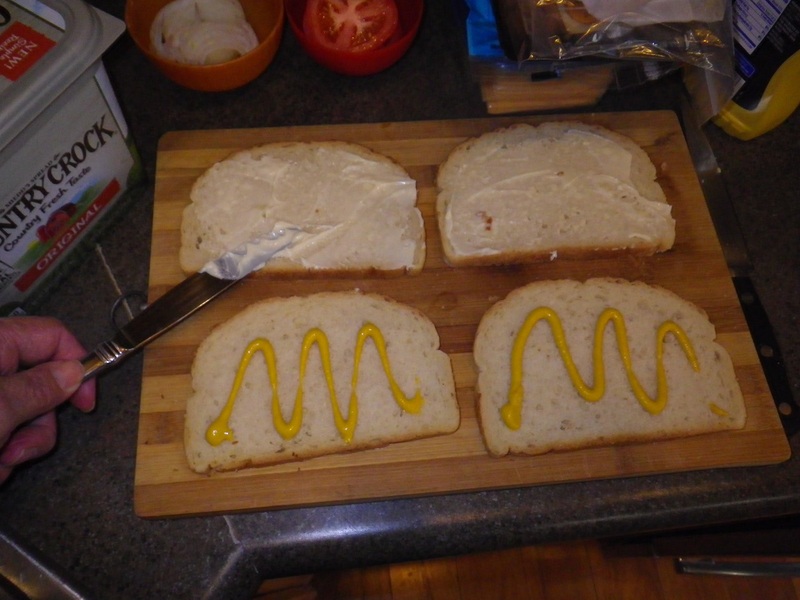 Turn the bread over and spread mayonnaise on one side and mustard on the other side, to taste. 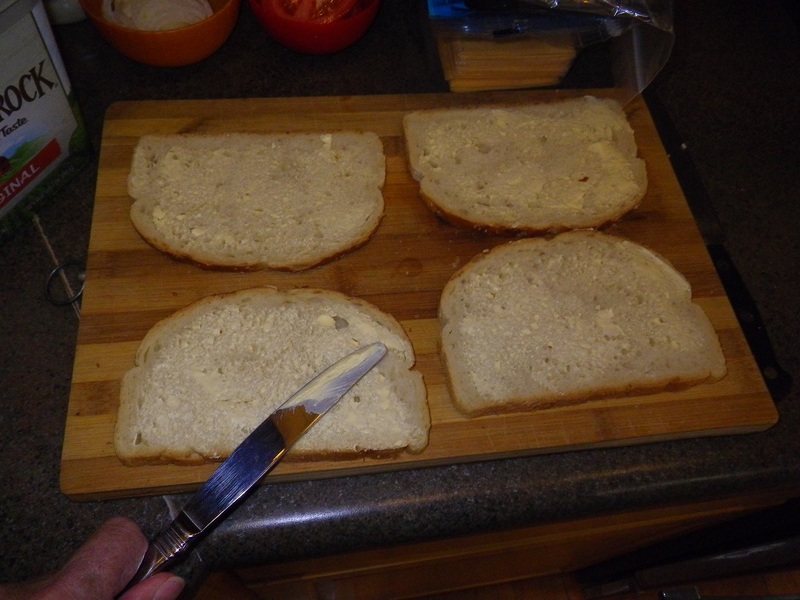 The mayo and mustard will also act as a barrier to keep moisture from the other ingredients from reaching the bread. Arrange the fillings: Put dry ingredients, the meat and cheese, next to the bread and the wet items, tomatoes, sprouts or lettuce if used, in the center. You will be toasting the bread and melting the cheese but filling items may not cook thoroughly unless they are partially cooked beforehand. 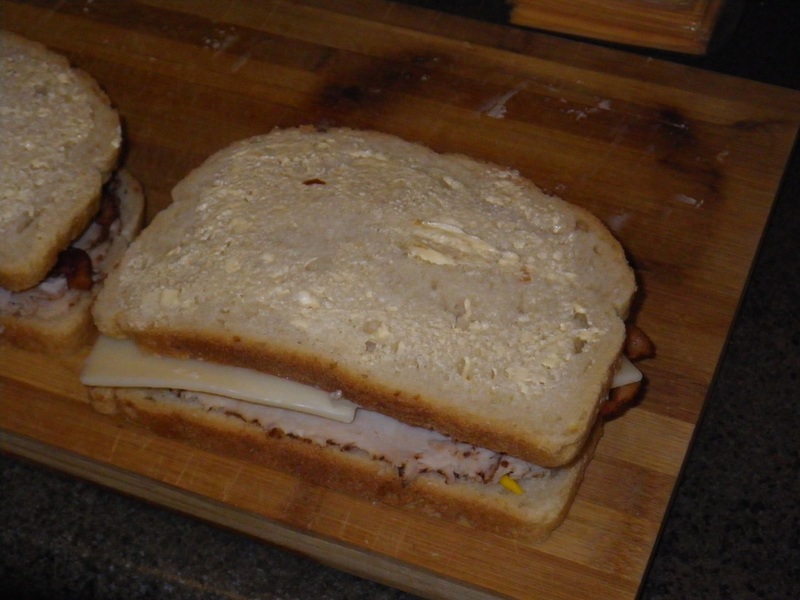 Two slightly different variations of the same sandwich are being prepared side by side, one with American cheese and the other with Swiss cheese and some onions. Grill the sandwiches on a moderat6ely hot grill, about 375°F, for 3 to 5 minutes or until the bread is toasted to a nice golden brown and the cheese hot and melted. Let rest a few minutes before slicing. Serve with your favorite side dish.